Set of 2 Passive Radiators pulled from a Definitive Technology BP-7006 Super Tower Speaker in excellent used condition. Sold As Shown. Definitive Technology 10" Passive Radiator (NOT A SUB WOOFER). This was removed from a Definitive Technologies BP9060 Floor Speaker. New Other - New never used - Only 1 - Black color - Box opened -Definitive Technology StudioMonitor SM45 Bookshelf Speaker. D (29,69 CM H x 17.15 cm W X 29.69 CM D). Trending at $136.32eBay determines this price through a machine learned model of the product's sale prices within the last 90 days. 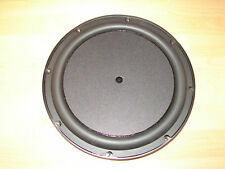 Definitive Technology - ProCenter 1000 4-1/2" Center-Channel Speaker - Black. Magnetic shielding ensures protection from video interference when the speaker is placed near a TV. Upward-firing long-throw woofers only require 1" of clearance so they work perfectly whether you open-mount the speaker or put it in a cabinet. 5" H x 5" D x 14" W. This speaker has actually seen very little usage as it was part of an A/V system at a vacation retreat. Local Pickup is encouraged. Definitive Technology - Demand D9 Passive 2-Way Bookshelf Speakers (Pair) - Piano Black. Definitive Technology Demand D9 Passive 2-Way Bookshelf Speakers (Pair). Model Number: DEMAND D9 BLACK. Patented Double Surround midrange/woofer provides greater excursion and output that results in superior mid-range detail and punchier bass compared to drivers of similar size. Item #: CS9040. Item Condition: New. The ProCenter 1000 loudspeaker is ideal for use as a center-channel speaker in conjunction with Dolby Surround Sound Pro-Logic and Dolby Digital decoding. Made in the USA. REQUIRES ONLY 10 WATTS AND HANDLES UP TO 200 WATTS.WOW! DEFINITIVE TECHNOLOGY UIW RSS II. DEFINITIVE TECHNOLOGY UIW RSSII (EACH). The RSS II's dynamic, spacious and uncolored sonic signature has been specifically engineered to blend perfectly with any of Definitive's loudspeakers whether freestanding, in-wall or in-ceiling for an amazing lifelike sonic experience. You will receive: 1 Definitive Technology UIW RSS II Surround Speaker Each - OPEN BOX. Definitive Technology - High-Performance 2-Way Center-Channel Speaker - Black. Definitive Technology High-Performance 2-Way Center-Channel Speaker. Improves driver excursion which results in the selected driver producing bass output usually associated with a larger driver, while retaining the improved dispersion and midrange definition of a smaller driver. Definitive Technology W7 Tri Polar Wireless Network Audio Speaker - Black. Condition is Used. Instruction manual included. FOR SALE IS A MATCHING SET OF CLOTH COVERS FOR THE BP-7006 SPEAKERS. BOTH COVER ARE IN EXCELLENT CONDITION WITH NO TEARS. THEY ARE CLEAN AND READY TO USE. tHEY WERE REMOVED WITH CARE. IT SEEMS LIKE MORE PEOPLE WANT CERTAIN PARTS VS. THE WHOLE SPEAKER. Definitive Technology - Demand D7 Passive 2-Way Bookshelf Speakers (Pair) - Piano Black/Silver. BDSS™ (Balanced Double Surround System) midrange/woofer - Patented Double Surround midrange/woofer provides greater excursion and output that results in superior mid-range detail and punchier bass compared to drivers of similar size. FREE SHIPPING! Buy NEW DIRECT from Def-Tech! Pull out from working Definitive Technology Pro Sub 1000 system. Definitive Technology - Demand D7 Passive 2-Way Bookshelf Speakers (Pair) - Piano Black. Definitive Technology Demand D7 Passive 2-Way Bookshelf Speakers (Pair). Model Number: DEMAND D7 BLACK. Patented Double Surround midrange/woofer provides greater excursion and output that results in superior mid-range detail and punchier bass compared to drivers of similar size. DEFINITIVE TECHNOLOGY MYTHOS SSA42. DEFINITIVE TECHNOLOGY MYTHOS SSA42 PASSIVE SOUNDBAR (EACH). Choose either gloss Black or brushed Aluminum finishes that have been hand-polished to a beautiful pearlescent sheen. This is what obsession sounds like. DEFINITIVE TECHNOLOGY CS-9040 CENTER CHANNEL (EACH). 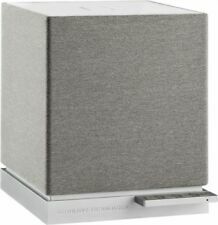 DEFINITIVE TECHNOLOGY CS-9040 CENTER SPEAKER (EACH). Center Channel Speakers. 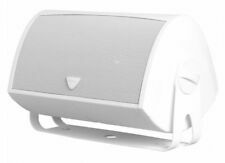 High-performance center channel speaker: 50 Hz – 22 kHz. Part Number - Pro Cin 800 BK. Manufacturer - Definitive Technology. The item is dirty and there are scratches from previous use. Definitive Technology ProCenter 1000 Compact Center Speaker Black, New! 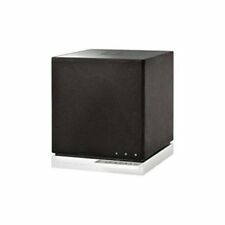 4.5 out of 5 stars - Definitive Technology ProCenter 1000 Compact Center Speaker Black, New! 4 product ratings4 product ratings - Definitive Technology ProCenter 1000 Compact Center Speaker Black, New! This newest generation of the Mythos Super tower still features a built-in powered subwoofer and sleek extruded aluminum end. The result is a wide listening area with excellent performance to the sides, in which you can clearly pinpoint action happening to your left and to your right. And it's designed to perform equally as well with your favorite music as it does with your Hollywood blockbusters. Designed and developed by Definitive Technology. Definitive has always led the industry with the best-sounding shielded center channels available. Because of this, Definitive pioneered the concept of full frequency range high-definition center-channel speakers. ONE 8’' PASSIVE RADIATOR ONLY for Definitive Technology BP-8040ST Part# 2344A182. Definitive Technology CS9040 High-Performance Center Channel Speaker with Integrated 8” Bass Radiator. This is what obsession sounds like. Manufacturer: Definitive Technology. We stay on top of changes in technology and what’s new in the marketplace to make sure we have the best value products in every range. Cabinets are black in color and sport a high-gloss finish with a wrap-around black grille cloth. Foam dampening pads and internal braces also aid in producing an optimal sonic effect. Though they take up less than one square foot of space apiece, these cabinets provide twice the auditory power of conventional speakers. Speakers are all in great condition. These speakers sound amazing and are much louder than one would think. I am throwing in a pair of speaker stands for the ProMonitors (Bookshelf Speakers) as well. 5-1/4" BDSS™ (Balanced Double Surround System) polypropylene woofer for smooth midrange and punchy bass. removable magnetic grille. aluminum front baffle. 5-layer piano black high-gloss finish. impedance: 8 ohms. Definitive Technology AW 5500 White (Ea) Specifications. Product weight: 8.33 lbs. New York is irresponsible and breakingNew York State Law. High-Performance Center Channel Speaker with Integrated 8" Bass RadiatorHigh-performance center channel speaker: 50 Hz – 22 kHz. Iconic and visually powerful design features machined, aircraft-grade aluminum construction.